New competition is coming to the online game store market as Epic Games is working on the Epic Games Store. The store will launch soon with a "hand-curated" set of PC and Mac games, and will open up more broadly to other games and to Android and other open platforms in 2019. On the company's blog, Epic Games markets its store with a high revenue split. 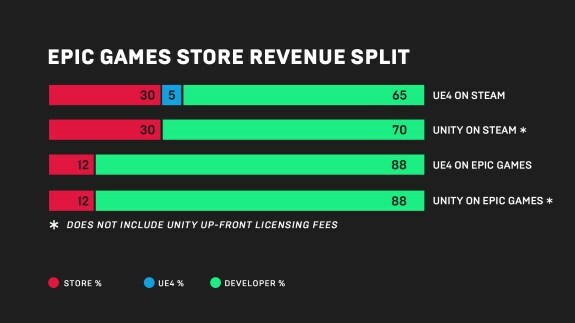 Game publishers selling titles via the Epic Games Store will receive 88 percent of the revenue, which is a lot higher than what they get via Steam. Epic will even cover the 5 percent royalty fee for Unreal Engine 4 for sales on the Epic Games Store, out of its own 12 percent.